We recently had the chance to take the new Honda Civic Hybrid for a fall color tour through Michigan's brilliant October scenery. After driving a number of Honda hybrids and only achieving mileage slightly above the non-hybrid versions of the cars, we were honestly a little skeptical that this new Civic was anything more than a tip of the hat to hybrid technology. But we packed our gear and took off through the countryside to see how the Civic Hybrid performed in the country as well as in the city. Some hybrids such as the Toyota Prius are designed for start-stop city driving, while others like the Chevy Volt do much better over long distances at speed. Where does the Civic Hybrid fit in on the hybrid spectrum? We were happy to discover that not only does the Civic Hybrid get good mileage at high and low speeds, but that it’s possible to beat the EPA estimated 44 miles per gallon fuel mileage rating without even trying. In fact, driving with the ECON button off made it even easier to cruise along at an average fuel economy of 48 miles per gallon without major adjustments in driving style. The ECON button maximizes the efficiency of the vehicle to theoretically improve gas mileage, but we found that it mostly reined in the power of the car in a way that simply required us to push the gas pedal down farther to get it to do what we needed it to do. So, ECON button happily turned off, we enjoyed the improved power and smoother acceleration. Even 48 miles per gallon isn’t fantastic for a modern hybrid, especially considering that number can drop in cold weather and that the ordinary Civic already gets 31-39 mpg, but we found the Civic Hybrid to be a very comfortable middle of the road kind of hybrid–just what you would expect from Honda. The car has heated leather seats, digital HVAC controls, satellite radio with navigation, and a smooth ride. The only glitch came with braking. This hybrid doesn’t plug in, which means it recharges its battery from regenerative braking. Unfortunately we could really feel the system bearing down, even automatically slowing the car to nearly a stop as we cruised to stoplights with minimal pressure on the brakes. The system suddenly lets go at about 2 miles per hour, giving the driver a little lurch to compensate for as the car comes to a stop. This seems completely unnecessary as no other hybrid on the road has this awkward performance, including other Honda hybrids. Other than that, though, the Civic Hybrid was an extremely comfortable ride and could get more worthy fuel economy numbers if driven very carefully. Check out our gallery of photos from our test drive to learn more about the features and foibles of this upmarket little cruiser. Your eco score is a long term rating of your driving efficiency, not a rating of your most recent drive. Since you were presumably driving a new car, the score was low. It increases over time, if you drive efficiently (my CRZ with 9000 miles just broke into the third tier). I bought a 2007 Civic Hybrid new and have been happy with it. I find it comfortable, and since I'm pretty much a slowpoke, I don't care if it is not "zippy." I take at least two drives every year of over 1,000 miles each, and average right at 50mpg. Average in local driving, and I'm consistently in the 43 range. The semi-heads-up speedo is a feature I like a lot. 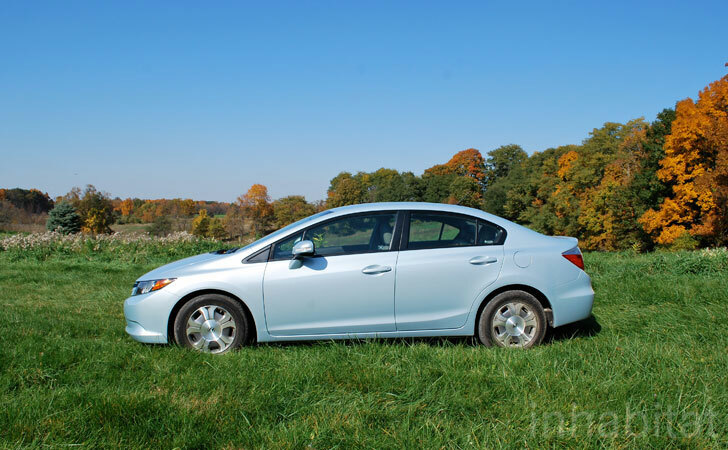 The first thing we noticed while driving the Civic Hybrid is that unlike the Chevy Volt's low-rolling resistance tires, this car's tires grip the road perfectly well. From the outside, it looks like any other Honda. We wished for some futuristic design element to hint at the green tech under the hood, but alas this is Honda we're talking about. Nothing outlandish here. The good news is that since Honda has known how to build a hybrid for a long time, the system is neatly integrated into the car without causing you to lose trunk or rear seat space to any clunky batteries. The Civic Hybrid has a more upmarket feel than its Insight sibling. Doors are better insulated and the interior materials are higher quality. The only hint that this is a hybrid comes from the aerodynamic shape of the grill and headlights. Did we mention the Civic Hybrid is more upmarket than most other hybrids of its class? These are heated mirrors. There's a hint, though to the casual observer "ECON" doesn't mean much. Lots of cargo space, plenty of foot room, and a cushy interior even prompted our toddler test rider to proclaim the Civic "a nice cah." Plenty of room for groceries or luggage, whereas in a Tesla Roadster you have enough cargo space for a small purse behind the battery. We prefer subtle badging to giant decals denoting vehicles as hybrids. This single small badge is classic Honda subtlety. Under the hood you find various and sundry engine and battery parts to make this traditional hybrid run smoothly. ... except at stop lights. Cruise to a stop and the Civic Hybrid seems to brake for you before abruptly letting go at 2 miles per hour. Unlike braking, acceleration is smooth, albeit underpowered when reined in by the ECON nanny button. These doors are decked out in plastic, but the fit and finish of the materials speaks to good craftsmanship. The only issue in the cockpit is that the digital displays are so bright at night you feel like you're driving a spaceship. Great for pretend play, not so much for seeing the road. This standard Honda gear lever is nothing special, but in true Honda style it is comfortable in your hand and shifts smoothly. There's that nanny button. Just leave it alone and no one will get hurt. 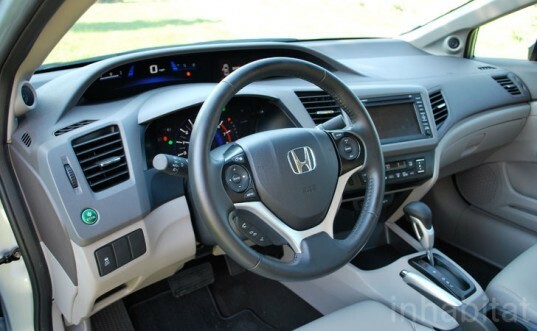 The interior buttons and features of the Civic Hybrid reminded us of an upmarket Acura more than a standard Honda. Here we have phone connectivity, a toggle for the display screen, cruise control, and audio controls all in buttery soft touch button style. Here is a standard Honda trunk release and gas cap button, though smooth to operate and mercifully larger than its tiny ancestor in Hondas of a decade ago. The speedometer features green and blue runway lights that help you learn which driving habits are fuel-efficient and which should be reined in. The colors weren't different enough from each other to draw our attention, however. Tachometers, which measure engine revs, will soon be novelties for the history books. This traditional one measures the amount your engine is straining to overcome the limits placed on it by the ECON button. The digital display is quite useful, with average fuel economy, total vehicle range, and other vehicle information. We were perplexed by the "Eco Score" that popped up to rate our driving every time we shut off the car. With mileage that beat the EPA estimated expectations, why were we continually rated below a one out of three score for economic driving? Hypermiling didn't even help improve our grade. If you have driven many cars with navigation you will appreciate that this is a good system. Simple, functional, and won't make you swear. Trust us, that's about as good as it gets right now. Audio functions can be viewed separately from the navigation system. Information about radio stations and artists displays both here and on the digital display on the dash. As usual, the navigation system makes you swear not to hold it accountable for anything it tells you to do while driving. The toggle button on the bottom right of the screen makes it easy to scroll over the map before you take the nav system at its word that it knows how to get you to your destination. We're beginning to love digital HVAC controls, which independently allow you to select temperature and fan speed. They're easy to control and fairly precise. Next up, humidity control. The center console also features a USB plug and power outlet handily concealed in the armrest, so this space stays uncluttered by gadgets. Overall we were very pleased by our week in the Civic Hybrid. We can't promise we would have been so thrilled with it in the winter, when the mileage would likely drop below the engined Civic alternative. If you like conservative, comfortable style with moderate hybrid benefits, the Civic Hybrid will make you a happy camper. It is the perfect car for a fall color tour.